Under the patronage of Major General Gamal Nour Aldeen, Asyout governor and Prof Dr. Tarek Abdullah Algamal, president of Asyout University, and in the attendance of Prof. Dr. Amr Ezzat Salama, chairman of the board of trusties of Hospital 57357 and former minister of education, Eng. 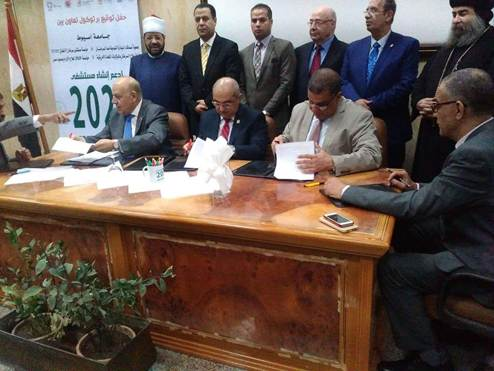 Lotfi Albadrawi, chairman of AFNCI, Prof. Dr. Sherif Abouel Naga, general manager of Hospital 57357 and secretary general of AFNCI, Prof. Dr. Hesham Alseify, president of Egypt Cancer Network, ECN-USA and a group of public figures, the five-parties protocol was signed, to support the establishment of Hospital 2020. To celebrate the protocol signing and to support Hospital 2020, the first charity marathon was launched. The starting point of the marathon was Asyout University’s administration building and the ending point was Hospital 2020’s location site. Two thousand students from various Asyout University faculties participated in the marathon. According to the protocol, it is planned to benefit from AFNCI’s unique experience with the establishment of Hospital 57357 to introduce a hospital operating system that functions according to international standards. The goal is to activate civil society’s role in establishing and operating governmental hospitals to contribute to developing and enhancing the healthcare system in Egypt, and to offer hope to cancer patients in Upper Egypt.